This will be our First Annual Spring Meet. 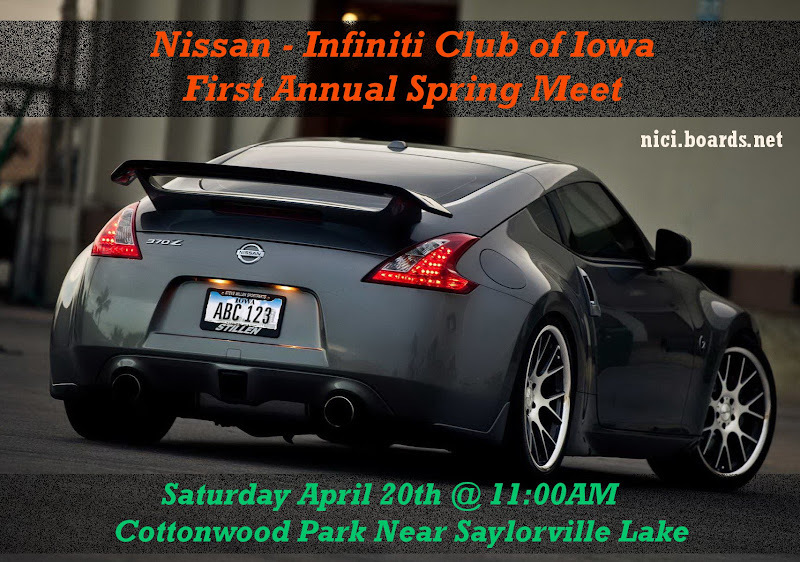 Come join us if you have a Nissan, Infiniti, Datsun or just want to check out some cars. We will be bringing Charcoal for the grill. Please bring you own food and drinks. This will be out at Cottonwood Park. We are not sure which picnic area yet. We'll update this as it gets closer. Lets see how many cars we can get out here. Any Nissan guys come on out and join us tomorrow! Should be a decent day! This will definitely be a fun filled weekend for all you guys. Maybe if you guys make it all to this one why not give it a second try for Sunday as well? Same area and ALL the nissans can be grouped together for a massive shoot.....of course provided the weather holds up. Either way I am glad to see this happening......I was also VERY EXCITED to be given the chance to make you guys's logo. I'll enjoy seeing them on all Nissan/Infinity's that join.....please make sure you guys can also show your support at the Rising Sun Promotion events!!! I'll be adding the nici logo to my banner for future events to come!! Well, hopefully if the weather is just as good as it is today you guys can ALL make it down to the 515 meet as well. Gives people more opportunity to showcase their cars. I'd like to see some pictures of this event today and if you guys are up for it.....head on down to the 515 meet tomorrow as well and REPRESENT your forum/board/car club. AND DEFINITELY JOIN the NICI Boards for sure........it is going to grow bigger and bigger each year and we want ALL car owners to support the scene......NO MATTER WHAT YOU DRIVE! !